I’m not a breakfast person. It could be because for most of the year I’m up at about 5am. I admire those of you who can eat eggs, shakes, or even (ew) steak at that hour, but not me. Whatever I eat, I want it to be quick, nutritious and fast. This is my most recent early morning break(the)fast. 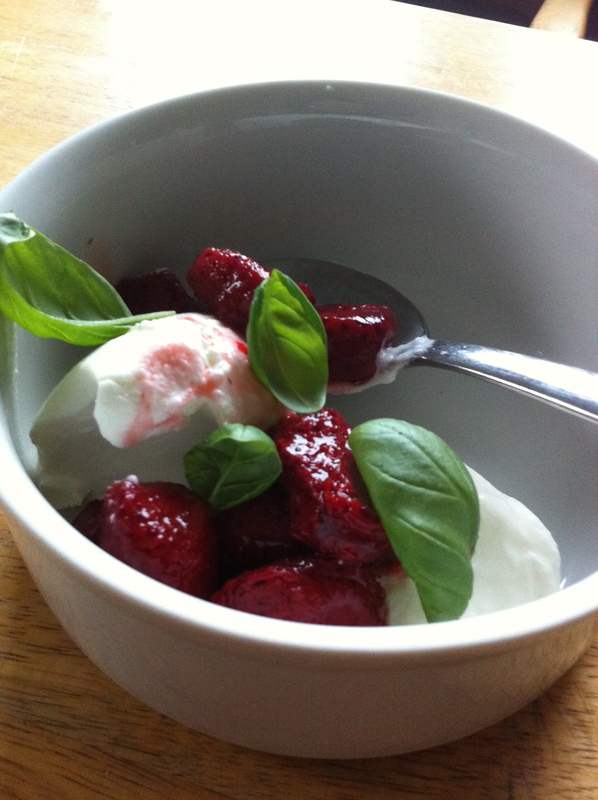 Greek yogurt, organic local strawberries (fresh when possible, or fresh frozen ones), and a sprig of mint or basil. That’s it. Enjoy. Shortcake, quit hogging the berries! Does anything spell the beginning of summer like strawberries? 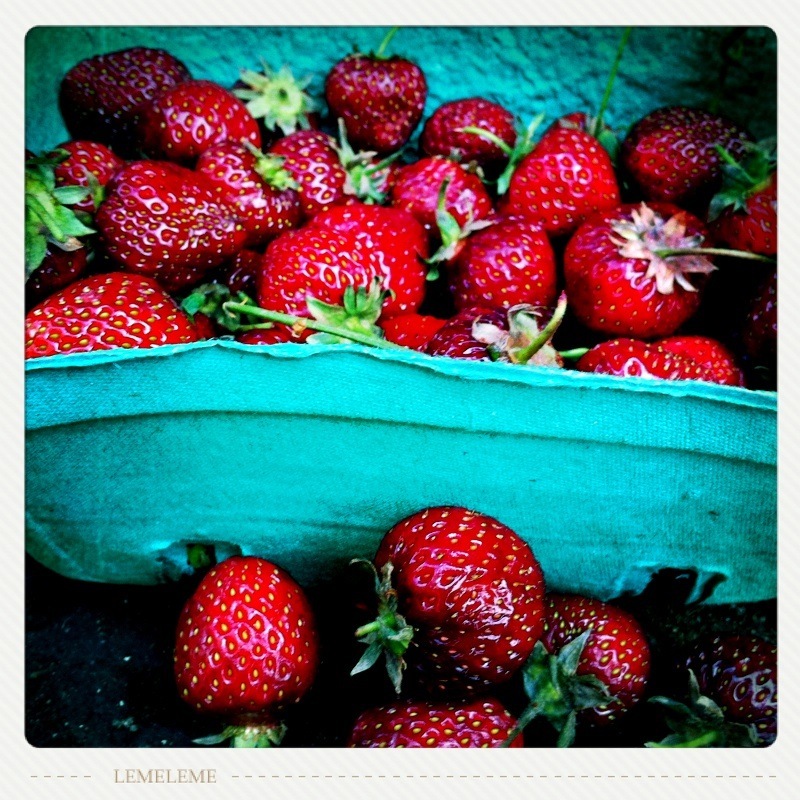 This week I finally had my first local strawberries (sorry, California, yours are good, ours are better!). Thankfully my oven still hasn’t been installed and I couldn’t make tea biscuits because the berries were gone before the batter would have been mixed. However, if I did have an oven, and a few extra flats of berries I would have had to make at least one batch of my moms tea biscuits, pour on the berries and maybe, just maybe, some fresh whip cream or ricotta cheese on top. For those of you with an oven (and with a special shout out to Mom!) here is a tea bicsuit recipe perfect for shortcake of any fruit variety. Preheat oven to 450degrees. Grease a 9×13 baking pan. Sift dry ingredients together. Cut in butter. Add milk . Bake for 15 min., test with a toothpick in middle. To serve cut in squares, then cut individual squares in half horizontally. Split apart and top with berries, cream and a sprig of mint for garnish. As an aside – they are great with a bit of butter or cheese as a special treat with your morning coffee on the patio in the sun with a book! As I write this I have no kitchen. Anyone who has ever done a renovation of their kitchen knows, big or small, it’s rather annoying. The dirt, the mess, the chaos. All the time spent planning the kitchen, barbequing, getting takeout and depending on the culinary skills of friends (thanks friends – paybacks are guaranteed!) has provided me with plenty of time to think about what makes my dream kitchen. … Friends, new and old. … Condiments, spices, oils and vinegars. … Music in the background. Especially showtunes. … Candles at night and flowers all the time. … Open bottles of wine. … Smelly cheese in the fridge. … The simple little food spatula that means I don’t spill as much on the floor when cooking. … The Le Creuset pot we were given as a gift many years ago. … The funny old pot holders that my Great Aunt made for me. … The weekend crossword sitting there waiting for the next brave soul. … The smell of cooking garlic. … Fresh herbs in pots. … The doorbell ringing as more friends arrive. Hmmm… Maybe I didn’t need to renovate after all….? What is in your dream kitchen? Day one. No kitchen. Big appetite. Few writing skills. There is no plan here other than to eat, drink and celebrate with friends and family. If I can be healthy along the way. So much the better. To fine food, wine and friends. Here’s to many joyful meals. Thanks for joining me at my table.